This casserole appeared on our dinner table earlier in the week. After wanting to make a savoury casserole that included grits, I finally developed a winning recipe that everyone could enjoy. Why grits? A friend from Tennessee gifted me with the last of her precious stash before she moved back home. After several experiments, this savoury blend of grits, eggs, and sausage is a dish that the whole family appreciates. And now y’all can enjoy some savoury grits too! Preheat oven to 350 degrees F (180 C). Brown onion in a medium saute pan. Add spices and salt. In a medium bowl, whisk together mayonnaise, mustard, and water. Add beaten eggs and whisk to blend. Stir in sauteed onions, grits, sun-dried tomatoes and sausage. 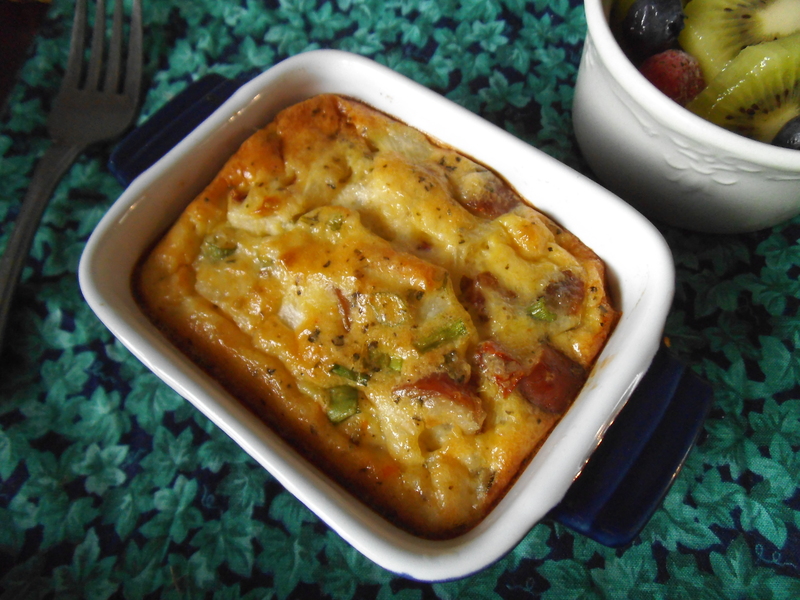 Pour egg, sausage, and grits mixture into greased 2 quart baking dish or 6 to 10 ramekins (the number needed will depend on the capacity of each). Gently stir to evenly distribute ingredients. Top with chopped green onions. Bake at 350 F degrees for 20 to 30 minutes, or until eggs are set in the middle. Note: If using ramekins or mini-casseroles, watch closely so that the top of the casserole does not get too brown. Let casserole stand a few minutes before cutting. Serve warm. Pennywise Platter, and Gluten Free Fridays. Thanks! I hope you get a chance to make it. I’m plotting to have it again very soon! You packed this with so much flavor! It sounds and looks insanely delicious! Plus I love that you ate it for dinner – breakfast for dinner rocks! I love the idea of sun dried tomatoes in it! My mom lived in Atlanta for a while, so I grew up eating grits (which are pretty uncommon here in Idaho). They’re so tasty! It is a really good flavour combination. I hope you can try it some time!